Fad diets have unfortunately caused people to think that certain foods are extremely unhealthy. However, these misconceptions have been disproved through medical research. Oshkosh live-in caregivers may have heard that these seven foods are unhealthy, but they can actually be very beneficial in a senior’s diet. This leafy green is often called a nutritionally void vegetable, but this is not true. A serving of lettuce contains half the daily-recommended amount of vitamin A. Brown rice seems like the healthier option, but it turns out that the phytic acid in the rice hull can leach iron from a person’s diet. Most modern white rice is actually fortified with all the nutrients that are removed in the processing steps. While egg yolks may be high in cholesterol, they actually contain a beneficial form of cholesterol that lowers overall blood cholesterol levels. Low-carb diets make potatoes seem as unhealthy as a few spoonfuls of sugar. However, a potato actually only contains about 160 calories, and if you eat it with the skin, the fiber prevents blood sugar spikes. Caffeinated beverages like coffee have a bad reputation for being loaded with calories and caffeine. As long as you drink your coffee black and have less than four cups a day, you will not ingest too many calories or exceed the recommended amount of caffeine. A serving of steak does not always have to be fattening and loaded with cholesterol. Modern grass-fed cuts of beef tend to minimize the fat while providing essential iron and other necessary nutrients. Many people avoid avocados just because they are higher in calories than other fruits or vegetables. 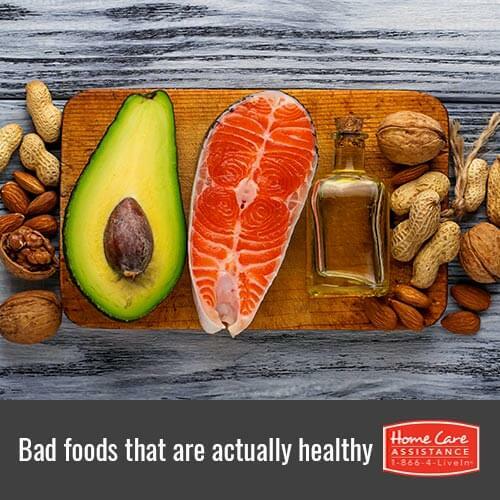 This food has over 20 vitamins and minerals and the healthy fat in avocados help to keep you feeling full longer. Therefore, it can be very healthy in moderate amounts. Oshkosh senior home care agencies like Home Care Assistance can help your loved one maintain a nutritious diet and get the nutrients he or she needs to live a long and active life. In addition to preparing nutritious meals for your loved one, we promote physical exercise and cognitive stimulation to boost physical and mental wellbeing. Set up a free consultation today by calling 920-710-CARE (2273) to speak with a friendly Care Manager.